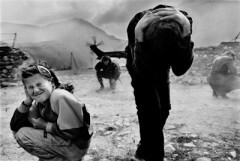 Exposure is the Institute for Global Leadership’s photojournalism, documentary studies and human rights program. Dedicated to mentoring and developing young, knowledgeable photojournalists and documentary filmmakers, it is allied with the preeminent photographers of the VII Photo Agency, Contact Press, and other distinguished journalists. Exposure has run documentary photojournalism workshops in Kosovo, Argentina and Philadelphia; published books and supported folios with the renowned de.MO publishers; mounted exhibitions; and probed the ethical and educational challenges of the media’s role in bringing important social and international issues to the public’s attention.